Whether you prefer to read it in print or online, The Lutheran Witness, the official publication of The Lutheran Church—Missouri Synod, is a must-read for Lutherans of all ages! 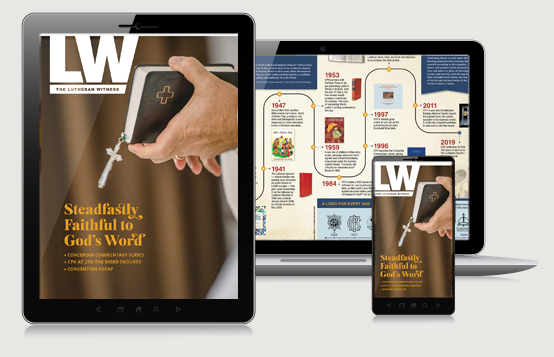 Published 11 times a year—monthly, with a combined June/July issue—The Lutheran Witness keeps you updated with news from around the Synod, and addresses topical issues with feature articles, columns, Q&As, and more that will both inform and inspire. or Sign in using your cph.org account. View a free sample today.